Helen Green had wanted to write a book this year. But it’s March already, and she’s not written a single word yet. Well, she’s written emails, and blog posts, and she’s even updated her About page. But her book? Not one single word. Helen’s enthusiasm about her book is slowly evaporating. Was this book the wrong idea? Will her readers truly like it? Does she know enough to write a whole book? Will she be wasting her efforts? What if it flops? Sometimes, Helen tells herself to get on with writing her book. Stop faffing about! Just write it! She blocks off a Friday afternoon in her diary. But more urgent work keeps her busy. Like preparing her coaching calls. Writing her next blog post. Getting dinner on the table. Helen feels miserable and guilty about her lack of progress. Why does she lack the willpower to write? Is she a wimp? Whether you want to write a book, blog more regularly or finally get that email series ready, achieving writing goals can feel like a daunting, perhaps even an impossible task. The theory about goal setting and planning seems simple enough. But the practice often feels different. Once you’ve set your smart goal, you can chop it into doable chunks. To write a book of 10,000 words, for instance, you may start with writing 1,000 words per week. After 10 weeks, you have a first draft and you can start editing. In my corporate career, I’ve always worked with smart goals. I knew exactly what I had to achieve, so I could plan my work. But since starting my own business I’ve shied away from setting big goals. And I’ve wondered for a long time whether there was something wrong with me. Was I not ambitious enough? Was I not a real entrepreneur? I felt like I was just muddling through. But somehow my approach of “muddling through” helped me create a popular blog, gain a ton of search traffic and run sell-out writing courses—something I’d never thought I could do. The more we care about something, the more we dream, the more fear shows up. Some people get excited by big goals. They jump into action ready to prove to the world they can run a marathon, lose 30 pounds, or write a bestseller book. These people are in the minority. They’re the lucky ones. The more important you believe the test to be, the more you have riding on the outcome, the more fear you feel. And then you find it difficult to concentrate. An answer you might have had down cold the night before seems to have withdrawn itself from your memory bank. Which small step can I take to write more today? Which tiny step can help me start writing that book? Which tiny question can my next blog post answer? Which tiny step can I take to procrastinate less today? We tend to underestimate how much we can achieve by doing small amounts of work on a regular basis, and by making tiny changes. Stephen Guise wrote his book “Mini-Habits” by setting himself a target of writing just 50 words a day. He argues that writing 50 words a day sounds like such a stupidly low target, that he could even do it when he was busy, felt tired, or had a thumping headache. Targeting 50 words a day may help overcome procrastination, but I struggle a little with the concept of nurturing a daily mini-habit of writing 50 words a day because I’m more productive when I focus on writing for a certain amount of time—even if I don’t write every day. To be productive, I need to write more than a few words because I also need time to think. I’m a slow writer. And when I set myself a target word count, the pressure to perform increases, and I don’t get into a flow. I’ve been most productive as a writer, when I sat down to write for two blocks of 25 minutes before breakfast, at least four times a week. I simply demand from myself I stay focused on writing without getting distracted and without worrying about the result. Whether your writing goal is time-based or word-based may depend on your writing experience and the type of writing you do. Stephen King, for instance, is an experienced writer who’s been exercising his writing muscles for many years—he knows what to expect from his writing and can set a target of writing 2,000 words a day—this is not a suitable target for beginning writers who may find Guise’s goal of 50 words more encouraging. Jeffrey McDonnell, an assistant professor, couldn’t find time to write academic papers until he started his “1-hour work day.” McDonnell decided to devote his first hour of the day to academic writing. Academic writing requires deep thinking so a word target is less appropriate than a focus on doing the work. You can write faster and hit a higher word count if you’re communicating ideas you’re familiar with, but you’ll need more time for thinking and restructuring when you write to learn and discover. Whatever writing goal you set, it’s important your goal is doable without inducing fear. Your goal should be to nurture a regular writing habit rather than write that bestselling book. When writing becomes a habit, it becomes more natural and automatic. You side-step procrastination. You write because you want to write. And even when writing feels hard, you still enjoy it—like a strenuous workout in the gym. At the end of your writing workout, you feel content. PS Thank you to Kathy Keats for inspiring this post. This post came just in time. After all the design, visits and other stuff of my future London Guide, the time of writing has arrived and I’ve been struggling to get started. I’ve been exhaustedly documenting myself into British history but today I’m expected to reach 2017 so tomorrow I’d start writing. I’m thrilled and full of fear as you mentioned earlier. This post is a motivation that came just in time. Thanks for being an inspiration! Oh, thank you for writing this today! Sometimes I feel like I am just not cut out for this because I really struggle even to voice my ‘big goals’ to anyone but myself. Firstly, they feel big for me, but in the grand scheme of things they’re pretty small. And secondly, because of that crazy thing about not meeting them (on time). This post resonates with me in so many ways. I have had great success with setting tiny goals and following through for 4 days and then setting my sights on the next 4 days and so on. Having a project-based mindset “This isn’t for the rest of the year, it’s just for the rest of the week/month” really helps me. Thanks Henneke, that was a breath of fresh air at the right time. I’ve been sulking a little in the last few weeks as things have not conspired to help me be productive. Now I feel heard and energised again. “Some people get excited by big goals… These people are in the minority. They’re the lucky ones.” This was an eye-opener for me, too. I thought I was crazy to focus only on my next step, and keep plodding step by step. I’m definitely a tortoise! I think I’ve let go of trying to turn myself into a hare, it’s just not going to happen. Plus, over time, a tortoise gets quite far and has more time to enjoy the journey and the landscape. Do you know the book “Henry Hikes to Fitchburg?” It’s a children’s book, based on Henry Thoreau’s idea of spending less time to earn money and more time doing things that interest you (going slow rather than fast). I find it endearing and reassuring – it’s okay to go slow. I love the idea of the project-based mindset—when you have to think about writing every single day of the year, it starts to feel daunting. But doing it just four days sounds doable, and before you know you’ve nurtured a new habit. Thank you for adding your thoughts, Alison. I appreciate it. New post inspiring the best of freelance writers (or writers in common) to get into track. I loved the idea of Stephen Guise, which is somewhat similar to what you suggested me a couple of weeks ago. Breaking down your big haunting tasks into smaller tasks makes it easy to see them as vincible and even when you are not in the state of fighting a war with the big demon you can still have a bit of courage to accomplish smaller tasks. Have a great week ahead Henneke. Yep, that’s true – smaller tasks and smaller goals often go hand-in-hand. Good point! Thank you, Swadhin, and happy writing! Thank you once again for a great post. I think I’ll set my goal to 50 words per day again, just to start off doing something, because I think overwhelm got the best of me with too many tasks, not knowing where to start and then deciding to just leave everything for tomorrow – naturally still waiting for tomorrow to come. So my goal 50 words and at least finish one task. Ah, yes, I know the feeling of leaving everything for tomorrow, and then tomorrow never really arrives! 50 words a day helped Stephen Guise to write a whole book, so you can get far with tiny goals. Let me know how you get on? I’ve known it for ages and boasted, even, that I write better with pencil. As currently as last month, during a ten-hour trip, I was not the one driving, but I wrote. Not only is the quantity improved (to write, at all, increases quantity over procrastinating!) but also the quality. I intended those answers as light humor, but I knew it was truth. And you’ve teased it out of me again. Thanks! Aren’t we all masters in faffing about? And yes … the finish line. I used to be completely driven by deadlines, but it’s an exhausting way to write and it doesn’t really work for big writing projects because the deadline feels so far away. In such a case, the one-hour working day can work wonders. I look forward to hearing how you get on with it! As our New Year’s resolutions start to flag, advice like this is heartening. My most recent iteration has my must-dos happening before 10a. Everything after that is gravy. The days I need an extra bit of TLC aren’t failures. Much easier to keep plugging along if your bare minimum is ridiculously simple. Not easy. But simple. As always, thanks for sharing your process. It’s quite invaluable. Yes, for bad days, I run a different schedule and I’m happy when my courses are just motoring along. Especially when you suffer from low energy or have other big demands on your time, it’s good to keep schedule flexibility and not set the goals too high because they’ll just frustrate you. Riffing off of Anne Lamott’s advice, I’ve always been partial to Tim Ferriss’ encouraging words: “My quota is two crappy pages per day. I keep it really low so I’m not so intimidated that I never get started.” Now THAT … I can do. “My quota is two crappy pages per day.” That’s a great way to formulate a goal without putting too much pressure on yourself (and circumnavigate your inner perfectionist). I like it. Thank you for adding that! What a relief! This is the question for me. Thank you! That tiny question is surprisingly powerful. Happy writing, Wendy! Excellent post, though I can’t peg the category I fall into. Once I start an article, I want to get it done, no matter how many hours. I do try to set a target of words per post. I don’t always reach it. If a post is complete long before I’ve reached my word count target, then it’s complete. No point forcing things. I just can’t do that. I have to step away to let an article stew, and then I can get back to it to finish it. I’m not smart enough! No, I let it simmer too. But I push hard at the start. Getting an hour of writing in first thing every day, that seems like a good idea. I think I need to try that one out. Will start tomorrow. The trick with me is to write before breakfast and before getting distracted by email, newspapers or Twitter. As soon as I read other stuff before I write, then starting to writing is much harder. Happy writing! This is really a great read. Composing an article having insightful content sometimes becomes difficult. But, we have to write at least one article in a week otherwise, we will start losing our visitors moreover, I also felt that Google Bots will not visit your website which ultimately affects the indexing period of our blog in SERP. I’m no SEO expert but I don’t think you have to publish every week. Brian Dean at Backlinko, for instance, gets a ton of search engine traffic and he only publishes once a month or so (I don’t really keep track, he might be publishing even less than that?). I love the idea of micro-movements. Thank you for sharing. I find, for instance, that if a document is already open before I start writing, then it’s easier to get started. It sounds bizarre, but it really helps to open that document, make a cup of tea, then start writing. I guess it’s a tiny ritual. I also like your point about not having to write. When writing becomes a chore (a “have to”) it already becomes cumbersome. When we can re-connect with why we want to write, then we already feel more motivated to write. Aren’t we, human beings, complicated? Small tricks can make a big difference. My pleasure Henneke and yes we are a tad complicated, and I’m OK with that ? This inspires me a lot. I have been planning to start my own blog and I kept postponing for months! I’m a mother of three and it can get pretty hard finding time to write. Plus, I write for a living (website content) so when I come home, there is this feeling that I don’t want to look at a computer screen for now. So, I write ideas on paper first. Thanks for the subtle push. I need to set mini goals to get that blog started soon. Looking forward to your posts! I think just the idea of starting a blog and having to keep up a regular schedule can make it feel daunting (especially if you’re busy like you!). But you don’t have to publish every week. You can also see your blog as a collection of articles to show to potential clients you know how to write their web content. Add to the collection only when you have a new blog post. Start small, and see how you get on. Let me know? Thank you so much again for being such an inspiration. Thank you so much for your lovely comment, Yasmine 🙂 Happy writing! Timely, yes! I started my blog. First. Post. Ever. In the last six months, I made the leap of getting to know some writers through Facebook, something else I had never done, but (short version) because of those connections, real people commented! It was so invigorating. But I had promised a post a week…and…it’s been longer than that and I haven’t written my second one. I am a slow writer too, and learning so many things since I retired from full-time work…it’s a big, new world, and I find myself needing to think a lot, like ‘Henry’ in the lovely children’s story mentioned above. Your post has reassured me, thank you. I will write when I am ready, and not in a state of fear. That way, the new post will have time to turn out well. Wonderful insights from others here as well. Sweet. Congratulations on publishing your first post. Yay! I’d like to nudge you not to wait too long with starting your second one. Don’t wait for the muse to show up because she won’t show up until you start doing the work. No need to put a lot of pressure on yourself to post, but it’s good to keep momentum going and start working on the next one step by step. Thanks. The post is in the making. It has had to take the time it has; I saw another one coming up on same person and decided I didn’t want to be covering the same territory. Thankfully, that will not happen. The writing is coming easier now. And thanks, Henneke. Momentum on target! Thanks for the nudge. And I like be commentluv. I am such a novice that I don’t know where you post a blog. Everyone here seems to know so clue me in. Enjoyed the article and comments. Hi Mark – Most people publish their blog posts on their own website. If you use WordPress for your website, then all blog functionality comes built in. Yes, so true … baby steps also move us forward; and that’s true even if we stumble around – just as long as we get up again like small kids do, too. I never set big (hairy) goals. Funny story: just like you, I used to think “there is something wrong with me”. But I found out that setting bigger goals never worked for me, because every time something got in the way: Either life in general or something I would discover on my way to this goal that will make me change it or even not want to reach it at all. I operate like that little person on a donkey from the computer game “Civilization”. He generally knows that he wants to conquer the world, but he also knows that right now he needs to decide on which of the 3 visible squares he will spend his only move. 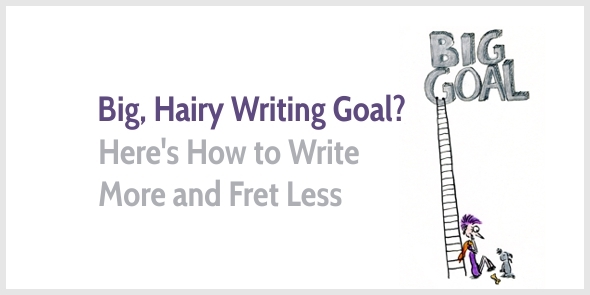 So I absolutely agree, big hairy goals are totally overrated. I don’t know the computer game “Civilization” but I like your description. This is how running my business often feels… a forward visibility of a few pixels. But we can conquer the internet pixel by pixel! That was an awesome and very honest piece to read. I am sure any writer would feel so relieved to be able to accept that it is OK to have small, achievable goals. No matter how much one loves writing, it can still be a daunting task when it has to be accomplished among all the other important tasks. “Write no matter what” only works when the amount of writing is manageable and reasonable. Setting a 2000 word count limit for a day can make you look like a serious writer – but achieving it on a regular basis certainly requires practice. And it is not for the beginners. I easily write 2000 words a day these days (with an exception of these past 3 months since I am a mom again) – but it took me months to get there. I started with 100 words a day and then increased that to 500. Congratulations on becoming a mother again, Jane! “‘Write no matter what’ only works when the amount of writing is manageable and reasonable.” Yep, that’s so true, and what’s manageable differs from person to person, and from project to project. Happy writing, Jane, and thank you for stopping by. Yes, I’m pretty much the same. When the habit gets interrupted for some reason (holiday, illness), then it’s really hard to get going again. I tell myself “I can do this, I can do that, I can, I can, I can” and end up doing nothing – just get busy with nothing. then I find out I work better when changed so I sit back and wait to be challenged…the flame dies out and that’s it. until another spark comes and off I go “i can, I can, I can…” and waiting. now i’l start with writing for just 1 minutes before each meal. PS since I subscribed to echantingmarketing.com, I’ve been more pushed to write, I found out I just need to get in state(get to my writing table with my pen and paper). For me, waiting to be challenged or until inspiration strikes has never worked. I have to do the work, and put the hours in, and eventually inspiration will turn up. Sometimes that means writing ugly drafts and dragging myself through endless revisions, but eventually it’ll lead to something. Happy writing, Cynthia. Let me know how you get on? I like your idea of 1 minute before each meal. Ms. You are such a great motivator! All of your information is very inspirational. Thank you, Kenneth. Happy writing!